Oh the possibilities of a pear! A staple fall fruit along with apples, pears are best in the autumn season. Varieties are plentiful, so here is a simple break-down of the best uses for each type: Bartletts are best eaten raw, Anjou are versatile and fare either raw or cooked, and Bosc are great for poaching. Armed with my bosc pears from the Union Square Farmers Market, I began the search for the perfect spiced baked pear recipe. The permutations were endless, as pears pair perfectly with so many things. To poach in chai tea, or bake in its own juices? Top with an oat and dried fruit filling, or bask in orange peel and cinnamon? Caramelize in sugar, Riesling or port? After some research on different types of baked pears, I ended up with my own creation. 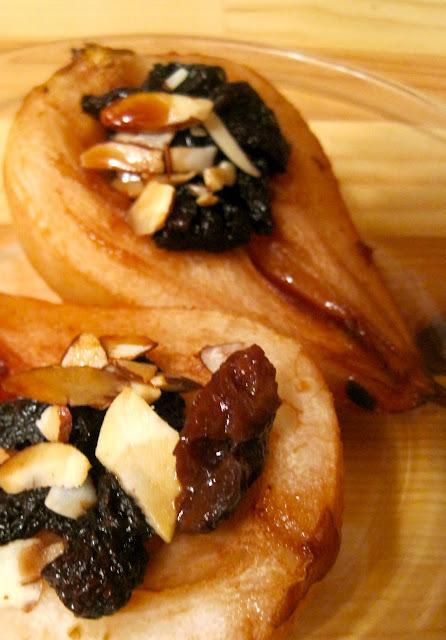 In extracting parts from Smitten Kitchen, Eating Well, and Sweet Peas Kitchen recipes, I concocted Baked Pears with Dried Cherries, Almonds & Port Sauce. Eating Well's port and dried cherries combination immediately caught my eye, as I had some leftover port straight from Portugal and envisioned the thickened, sweet sauce I knew only an hour of baking would produce. From Smitten Kitchen I stole the vanilla, and from Sweet Pea extracted some roasted nuts for a more substantial filling. My mixing and matching worked well. The pears produce an irresistible aroma in the kitchen that was only superseded in taste after they came out of the oven. The resulting thickened, port sugar vanilla and cinnamon sauce was so fragrant and delicious it made the hour wait totally worth it. I like this recipe because it can be served as a healthy dessert or light snack. One bite in, and it doesn't matter if you're not sitting by a fire or in view of bright autumn foliage- fall will feel like it's here. 2. Peel, halve (through the stem) and core pears. Transfer to a baking pan lined with parchment paper. 3. Combine port and cherries in a small saucepan. Bring to a boil, reduce heat to low and simmer for 5 minutes. Stir in sugar, lemon juice, vanilla, and cinnamon and let cool. 4. Add port sauce to pears, carefully spooning cherries into the hollowed core of the pear, and distributing liquid evenly. Sprinkle the almonds on top of the dried cherries. 5. Bake pears for 55 to 60 minutes, brushing them occasionally with the pan juices. They are ready when a pairing knife easily pokes through the thickest part, and pan juices thicken. 6. Serve warm, spooning sauce from the pan over the pears, and top with ice cream and crumbled biscotti cookies (if you want to indulge) or nonfat greek yogurt (if you're being good). "Pears News." New York Times. Web. 28 Sept. 2011. <http://topics.nytimes.com/topics/reference/timestopics/subjects/p/pears/index.html>. Wow those pears look beautiful! Such a decadent dessert for fall!